Usually, I share recipes on this blog which are inspired by produce from one or two fantastic local suppliers around Belfast and further afield. This time, instead of a new recipe, I’d like to introduce you to SculleryMade Black Puddin’! This is the first product to come out of the Scullery and make it’s way onto your plate and I couldn’t be more excited to share it with you! The idea for the Black Puddin’ came; like all great ideas do, after soaking up a few beers. Homebrewed Rye IPA if you want to get all brewster-technical about it. See, with homebrewed beer you get the chance to mix and mash all sorts of blends of malted grains to give your beer a unique base flavour. With all-grain brewing you make a warm, soupy, malty mash that’s not unlike a sweet oaty porridge, and you extract as many of the delicious sugars and proteins from the grains to feed your yeast in fermentation. Your kitchen fills with the most incredible malt smell and when you’ve strained all the liquid off for fermentation you’re left with kilos of sweet, delicious spent grain. You couldn’t just throw those out – could you? Some people use spent grains in breads, cakes and dog biscuits. I’m not a massive fan of at least two of those three, so instead I thought I’d have a go at creating a black puddin’ recipe that would welcome a bit of sweet, malted grain into the fold. After all, I love a bit of black puddin’ and one day (when I finally get a patch of grass on this wee Island) I’d love to raise a wee porker and feed it with spent grains from homebrews and create a black puddin’ from the beautiful beast with a special batch of grains from a homebrewed breakfast ale… one day! Then I set about making the Black Brew Puddin’ by adding the spent grains to the Original Black recipe and changing the seasoning a little to reduce some of the sweetness from the grains… the extra grain really adds to the texture of the puddin’ giving it a bit of bite compared to the melt in your mouth Original Black puddin’. The plan is that with each individual beer brewed, the flavour of the Black Brew puddin’ will represent the base style of beer. If you’re an all-grain homebrewer, or a microbrewer, drop us an email and we’ll see about giving your style a go with your spent grains! Black Brew – spent grains from an IPA grain blend of American 2-row malt, Caramel 20L malt, Victory malt & Munich Malt. Finally, for my chilli-loving family & friends I made a recipe with a kick of chilli and a spoonful of roasted coffee grains to add a rich bitterness to it and Black Lava was born. What a bit of craic so far! 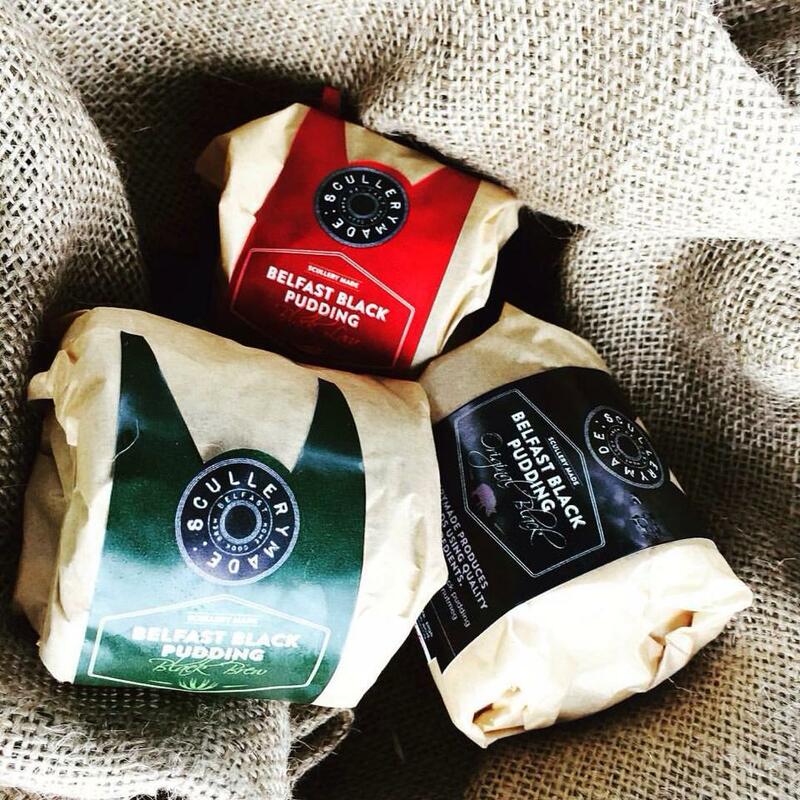 The feedback has been great, a couple of people noting that the texture isn’t what they’re used to with Irish black puddin’, but then the Morcilla style is not as dry as some of our most popular puddin’s around the country. It’s not going to be everyone’s cuppa tea … whether or not you’ll like it though, well the proof is in the puddin’…! SculleryMade Black Puddin’s are available from SculleryMade regularly at Inns Market on the last Saturday of every month.